What Vaccinations do I need for Algeria? Based in North Africa, Algeria is home to over 37 million people with Morocco to the west, Tunisia and Libya to the East and Niger to the south. There is a Risk of Malaria in Algeria. See advice below. There is No Risk of Yellow Fever in Algeria however Travellers arriving from countries with a risk of Yellow Fever may need an International Certificate of Vaccination (ICVP). There are still ongoing conflicts and tensions in Algeria and the Foreign and Commonwealth Office (FCO) advise against all travel and all but essential travel to most parts of the country. Anyone considering travel to Algeria is advised to check up-to-date travel advice and warnings. The table below provides a general guide as to the Travel Vaccinations that may be advised to you for travel to Algeria. Malaria is spread by the plasmodium parasite passed to humans from the bite of an anopheles mosquito. Malaria is a serious illness with symptoms include fever, chills, sweats and flu like symptoms. In severe cases, malaria can be fatal. There isn’t currently a vaccine available for our travellers, although there are other ways to protect yourself, see Malaria Information for Travellers. There is a Low Risk of Malaria throughout Algeria including Adrar, El Qued, Ghardaia, Illizi, Quargla and Tamanrasset. Yellow Fever is not present in Algeria. There is therefore No Risk of Yellow Fever transmission in Algeria. 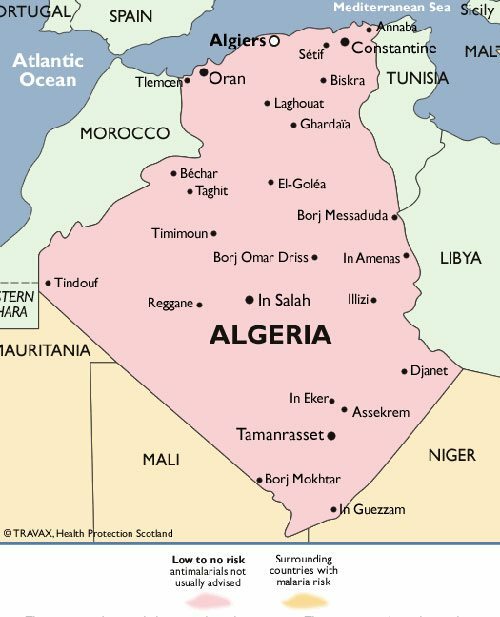 There may however a Yellow Fever Certification Requirement for some travellers to Algeria. For further information, please see Yellow Fever Certification Requirements. Under International Health Regulations (2005), travellers who have been to an Area affected by Yellow Fever, or who have travelled via an airport of a country affected, are required to present an International Certificate of Vaccination (ICVP) before they are allowed to enter Algeria. Based in North Africa, Algeria is an extremely diverse country offering Roman ruins, Ottoman palaces, the Atlas Mountains, the Sahara Desert and the Mediterranean coastline. Algeria is a mountainous country and has a number of areas of high altitude including the Atlas Mountain Range. Travellers intending on travelling to areas above 2400 meters above sea level ought to take precautions to reduce the risk of experiencing Acute Mountain Sickness which is a potentially life-threatening illness. When travelling to Algeria it is advisable, as with any travel that you protect yourself from food and water borne diseases, take adequate measures to protect yourself from over exposure to the sun, try your best to avoid insect bites and of course keep your personal safety at the forefront of your mind. Always make sure you check travel updates for destinations of travel with the foreign office particularly for travel to disaster areas and areas of conflict. Schistosomiasis is a flatworm infection that is acquired through contact with infected fresh water streams, rivers or lakes. Travellers to Algeria should take precautions and avoid swimming or wadding in infected areas.